With good weather on the horizon for some, though sadly not all, I thought it’d be a good time to think about how to pull off that most effortless of looks of ‘shoes with no socks’. Before you head off into the night, always ask yourself whether it’s the right time to be going sockless. Attending your boss’ award ceremony without a pair of your finest cotton slip-ons may not be the best choice in attire. Save your sock-free evenings for casual occasions – barbecues, garden parties and evenings by the beach. Is it the right weather? Check the forecast before ditching your hosiery – the last thing you want is to catch a chill with your naked ankles exposed to the elements. If you so much as sniff the chance of a cool, damp day, always avoid the sockless look. Are you feet up to scratch? Do you really want to stick stinky feet into your brand new canvas shoes? Probably not if you don’t want your nearest and dearest running a mile! Have a good soak in hot water a few hours before attempting to go sockless. Try applying a little talcum to avoid any damp, but don’t go overboard – too much powder can leave your shoes a mess. Are your shoes up to scratch? With your feet ready to insert, ask yourself whether you’ve got the right pair of shoes. Those stiff oxford brogues aren’t going to be your friend, that is unless you’re a fan of large blisters and sores around your ankles. Grab ‘low profile’ slip-ons that won’t shred your joints to bits. Loafers, espadrilles and canvas sneakers are all good potentials, especially those crafted from soft, supple leather or breathable cotton fibers. Top Tip: Try wearing in your shoes for a couple of weeks before ever going sockless. This will break down any stiffness you may encounter and mould the lining to the natural contour of your foot. What about my leg wear? 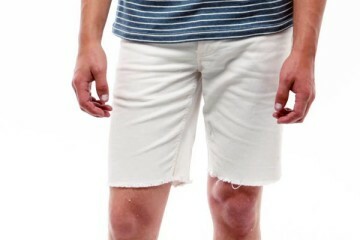 Naturally, the most apt answer is go with shorts wherever possible for the cleanest look. That said, sometimes it simply isn’t practical; in these cases, you need to roll up your jeans or chinos. While there’s no set minimum for the number of ‘turns’ you need to make, I’d advise at least enough to prevent them from folding back down again. You can certainly try to up your game with a full three-piece suit added to the mix. A beach wedding is perhaps stretching things, but don’t try the look with an upscale restaurant; remember, you don’t gain automatic formalwear rights just by throwing on a jacket and dress shirt! I love the sockless look. I recently tried a product called “mocsocs”. They’re a half sock that are worn on the front part of your foot and they don’t slip off. I live in a hot and very humid climate. These half socks help prevent perspiration and potential odor. They feel great and allow me to have the sockless look I want. Mocsocs work for me, maybe they will for others also. I hate this look so much. Give it two years and the sockless thing will be more unfashionable than mullets and mid-riffs. I can’t wait for all the trendy douches to start thinking “what was I doing?? !” when they browse their own photos on their Facebook timelines. I myself hate the socks, I don’t know exactly what is the reason behind this; however it stifle by foot. However I am not in favour of the idea of not wearing socks with the shoes. I think you can go socks-less with sandals, flip-flops and with sneakers but not with formal shoes, shown in the above picture. By the way nice post; but the people may react differently to this idea. 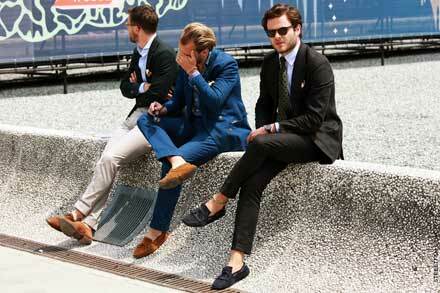 Lots of great tips here and on the other big style sites for going sockless this summer. 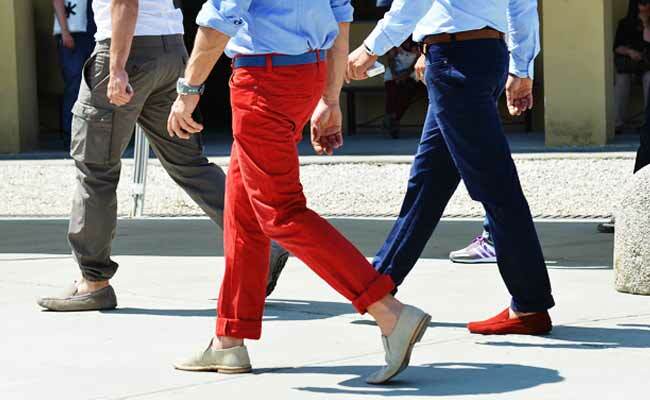 I’d add that, if you’re going to roll your jeans or chinos, make sure they are relatively slim fit and have some taper toward the bottom (leg opening). Otherwise, you’ll get that “clown pants” effect around your ankles. Can you please tell us the brand of this last shoe? The one with a blue shoelace? James is so right. But there’s one upside to socklessness: It makes identifying douche bags incredibly easy. You HAVE to be joking with this rot. Guys were wearing Gucci loafers with no socks in the 60s and 70s. It was the ultimate prep look. And, of course, boat shoes – Sperry’s on the east coast – started the whole look. But OXFORDS? Talk about trying hard to be cool! As I mention in the article itself Francie: “ask yourself whether you’ve got the right pair of shoes. Those stiff oxford brogues aren’t going to be your friend, that is unless you’re a fan of large blisters and sores around your ankles. Nice post. I certainly think the no socks look is a winner in most fashion styles/circles. Not sure it’d work with a three-piece suit but maybe I need to see it to be convinced?